The Lesser White-Fronted Boose Group has cometh to Greece in their odyssey. There they meet some modern Greek heroes, including a vital, local member of the group. Will the mystery of deceased goose be solved? How to safeguard the endangered Lesser White-Fronted Goose population? – Click the cartoon to enlarge it. This story above my friend, is a pure fictional fable. 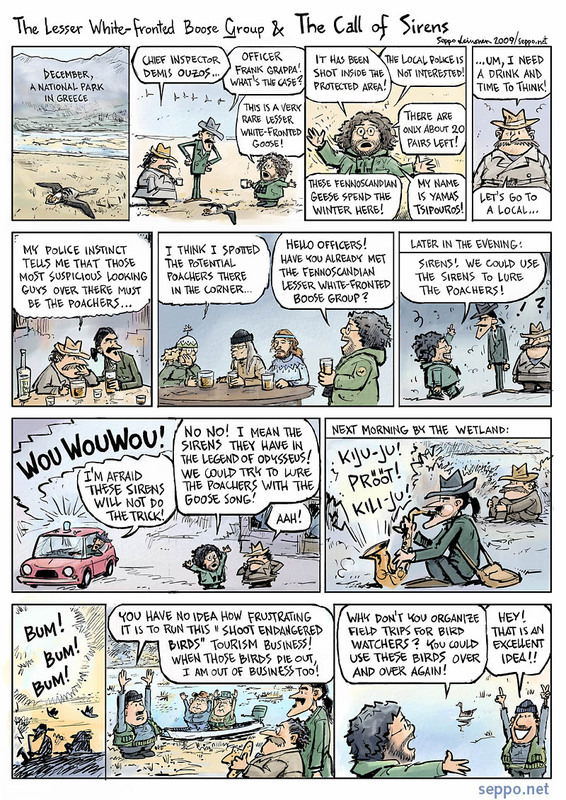 More cartoons about The Lesser White-Fronted Boose Group. Let’s save the Saimaa Ringed Seal! ← 350 Ways to make Easter Bunny Happy!